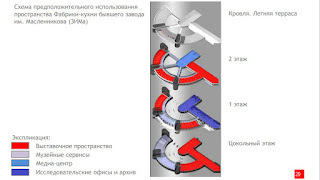 Last week I was contacted by my friend, architect Vitaly Stadnikov about the Hammer and Sickle Factory Canteen in Samara once more - the story of which was the first entry in this blog. It is at risk again as the local government is threatening to replace it with a replica, rather than restore it, as was agreed with the Ministry of Culture three years ago. This is a good moment to look back at the past few years and the research that has come to light about its architect, Yekaterina Maksimova, one of the Soviet Union’s first female architects, who died tragically in the same year that the factory canteen opened in Samara. The research below came to light half way through the campaign for the building. Information for this blog post is taken from Stadnikov’s findings, and that of architectural historian Alexander Isakov. 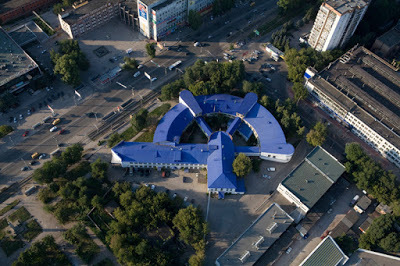 The Hammer and Sickle Factory Canteen, Samara, from the air. In addition, the campaign led Stadnikov to be appointed Chief Architect of Samara in 2012. I met him in Moscow in 2004, shortly after we launched the Moscow Architecture Preservation Society. Soon afterwards I visited Samara with him and we published a report with SAVE Europe’s Heritage. His zeal, fired originally by his interest in the city’s forgotten Constructivist heritage, led him to become deeply involved in the architectural development of Samara. For example, he devised a model for regenerating and restoring the historic centre of Samara, built on a grid system under Catherine the Great in the 18th century. During his time as Chief Architect of the city 2012-2014, Stadnikov successfully secured the future of the Factory Canteen: he managed to get the listing increased to regional level, and, working with local politicians, attract central government funding for its restoration and conversion into an arts centre. This was possible thanks in part to Alexander Isakov’s research, undertaken during his Masters degree, which has provided new depths for the historical and sociological understanding of the building. 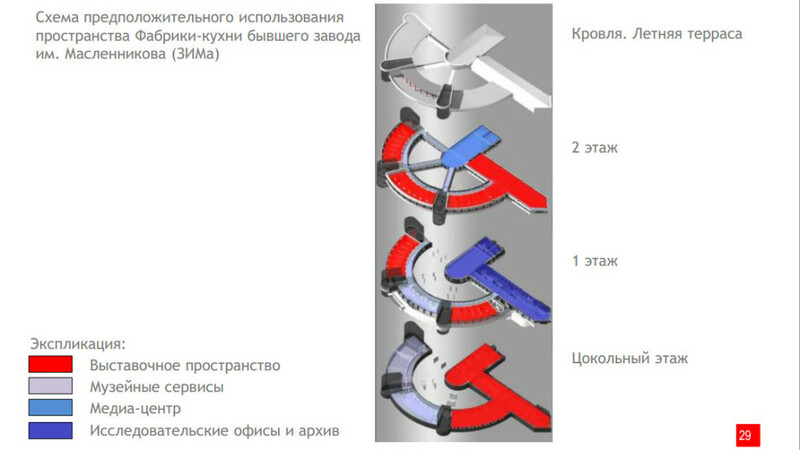 Now we know more about its architect Maximova, in addition to research made by Stadnikov into NARPIT - a merger of the first three letters of the two words: National and Nutrition - i.e. the National Nutrition Board. Maximova was one of the main architects for NARPIT, which grew out of the Commission for the Fight Against Hunger in 1923. It later turned into the All Union Society for National Nutrition and led to the construction of Factory Canteens all over the Soviet Union. NARPIT was born during the first five-year plan, at a time of intensive industrialisation. By 1930, 175 Factory Canteens were functioning all over the country, fuelling shock workers to industrialise and modernise the Soviet state in double quick time. NARPIT’s lead ideologue was Artemiy Bagratovich Khalatov, who developed the ‘rationalising of catering,’ in order to make food cheap and available to all, and to free up the work force for the creation of socialism. He was the prototype of the odious Andrey Babichev in Yuri Olesha’s novel, "Envy". During his research, Isakov came across a reference to the fact that the architect of the building, Ekaterina Makismova, was buried in Moscow’s prestigious Vagankovskoe cemetery, clear evidence that she had been an important figure in her time. He decided to look into her history and visited her grave. After searching for a couple of hours, Isakov found the grave and left a note on it, hoping that Maximova’s family would find it when they visited (in Russia grave visiting is a strong part of the culture). They did, and they allowed Isakov access to Maximova’s archive and hear the fascinating and tragic story of her life and that of her brother. Because of the regular dramatic political shifts in the Soviet Union during the 20th Century, and the persecutions, most archives are private and kept at home, except for those of major figures. 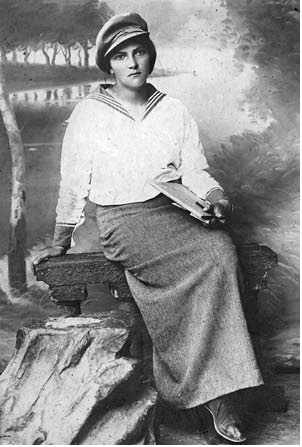 Maximova was a graduate of the St Petersburg Higher Polytechnic College for Women, that had opened in 1906. She commenced studies in 1909, and became one of Russia’s first trained female architects, and one of the first active ones in the Soviet Union. Her brother Vladimir was also an architect. After the revolution she assisted the great Russian architect Alexei Shchusev on the flamboyant Kazan Railway Station in Moscow, following in her brother Vladimir’s footsteps, who had also assisted Shchusev on some projects before the revolution. After the revolution, Vladimir Maximov, a deeply religious man who had been close to the Tsar, indeed the Tsar was godfather to his son, stopped practising - he refused to work for the Soviet authorities due to their atheism. From then on, Yekaterina supported the family: Vladimir helped her with her projects but never put his name to them. A monograph about his life was published in 2006, detailing his pre-revolutionary work including his work at Tsarskoe Selo for Nicholas II. This was later developed at the Factory Canteen in which the food is prepared in the Hammer and carried by conveyor belt to the dining area in the Sickle. Over seven years, 1925-1932 Maximova went on to build further Factory Canteens all over the Soviet Union, including in Dneprostroy, Ekaterinburg, Magnitogorsk and elsewhere. The Hammer and Sickle Factory Canteen was the last one she was destined to be involved with. Later in 1932, Maximova was crushed by a train and killed. 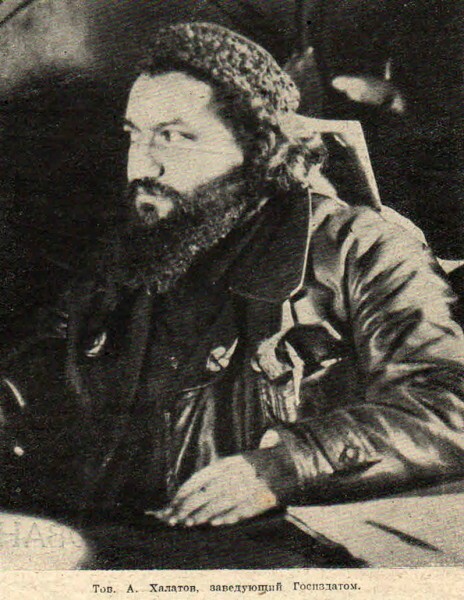 In 1932 a Five Year Plan of Godlessness commenced as part of the ‘War on Religion’, and in April of the same year, Vladimir Maximov was arrested on trumped up grounds. He was a member of a secret orthodox organisation called ‘the true Orthodox Church’ (Istinno-Pravoslavnaya Tserkov) which is likely to be the real reason for the arrest of him and his son. Vladimir Maximov died in the camps in 1942. Today, Vitaly Stadnikov is continuing in his crusade to save the building, with the full support of Russia’s Minister of Culture Vladimir Medinsky, who initiated the project to restore the Factory Canteen and convert it into an Arts Centre. The Russian Federal Government committed the majority of the money on the condition that there was some local money also forthcoming. This original intention appears to have got lost in translation: the Samaran local government put the restoration project out to tender, and the cheapest proposal came from a contractors who proposed full demolition and reconstruction as a replica. This would involve de-listing the building, which makes a mockery of the entire process, and puts the building into double jeopardy (once de-listed, why bother reconstructing at all?) SAVE Europe’s Heritage has written to Minster Medinsky asking him to intervene and to get the project back on track. Liza, Summer 1990. Gateway to Moscow.